Many children spend unmonitored time online. Over 50% of teens and nearly 30% of children are able to surf the Web without any supervision at all. Unfortunately, some use that time on the Internet to bully and harass others. And unlike the playground bullies of a generation ago, cyberbullies can harass your kids in your own home via your Internet connection. To help raise awareness about cyberbullying, Safe Communications, Inc. has made the documentary, Submit: *the virtual reality of cyberbullying. Watch the entire Classroom Cut below. 1. Accountability – Accountability is the willingness to open to others about your actions and motives. When it comes to computer, cell phone, and Internet use, children need an environment of accountability at home. Place all computers in open locations where the screen can be viewed by those in the room. Have open conversations about how and when the Internet is to be used. 2. Education – Talk about the problem of cyberbullying with your kids. Think back to your own childhood: bullying at school can start at an early age. The same is true for cyberbullying. Talk to your kids about how bullying is not only emotionally damaging but can harm someone’s reputation. 3. Model Your Values – Often adults and kids alike don’t connect their offline values to the online world. But kids and teens need to learn that what is done in the online world “counts” just as much as what is done in “real life.” Model and teach your values to your kids. Teach them about why bullying is wrong and motivate them to stand up for those who have been bullied. 4. Use Technology – Use accountability software to get a better idea about how your kids use the Internet. As Patricia Agatston, Ph.D., says, it’s about supervision, not “snoopervision.” Kids and teens need to buy into the concept and importance of accountability. As you use the technology, use it to start good discussions with your children. How do you know if your child is a target? Watch for warning signs. Is your child suddenly reluctant to go to school? Is your child spending dramatically more or less time online than usual? Does your child seem depressed or withdrawn from their friends? Is your child also a target for traditional bullying at school? If you suspect your child may be a target, talk to them about your concern. If you still aren’t sure about whether your child has been bullied, search for your child on Google. Search also for your child’s e-mail address, screen names they might use on IM, nicknames, mobile numbers, or your home address. Make sure you put quotes around your search term to narrow your search results. 1. Teach Healthy Reactions – Bullies often just want a rise out you. Teach your child not to respond or react to the bully. Often just ignoring them for a time will stop the attacks. If the bullying is coming in the form of messages through a cell phone, IM, chat, or social network, often there are ways to block a particular person from sending more messages. 2. Save the Evidence – Save all e-mails, IMs, or chat conversations. Take note of the days and times the messages were sent. If you are unable to save the actual messages, take screenshots. 3. Guard Information – Teach your children to guard all their passwords. Change passwords if you feel their e-mail or social network profile has been hacked. Make sure your kid or teen knows what contact information is and is not appropriate to post online. 4. Involve the Right Authorities – If your child knows the bully, perhaps it would be appropriate to tell the bully’s parents (but be prepared for a possible negative reaction). If the bully is a schoolmate, inform the school authorities. Some forms of bullying often violate the “terms and conditions” for e-mail providers, cell phone carriers, social websites, and Internet service providers. Contact these authorities if you believe terms have been violated. Some forms of bullying may actually be illegal. If this is the case, contact local law enforcement. Cyberbully411.org – Website for youth from Internet Solutions for Kids, Inc.
15% of teens faced online harassment last year. 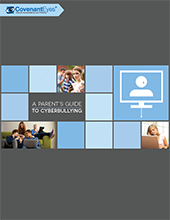 This guide will help you understand what cyberbullying is, why it matters, and what you can do to help your child. Can you please tell me what is in the Parent’s Guide to Cyber-bullying?